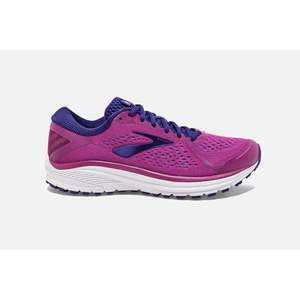 The womens standard B width Brooks Aduro 6 is the latest in a well cushioned road running shoe, ideal for remaining comfortable on short and long distances alike. The 12mm drop would suit traditional heel strikers and there are plenty of lower drop running shoes from brands like Altra and Topo. The clever 'crash pad' shock absorption system will support you several miles down the road, even if your form is starting to waver. They're breathable too, with an engineered mesh, so you're snug and your temperature is regulated. Omega Flex Grooves optimize forefoot flexibility. Reflectivity is seamlessly incorporated at the heel and toe.